While I was growing up, I was told that Gujarat is the birth place of Father of the nation- Shri Mohandas Karamchand Gandhi (The Half Naked Fakir and titan of the titans who defeated the strongest and mightiest power of the world without even firing a single bullet). It is also the ancestral place of Quaid-E-Azam of our neighbor Pakistan –Late Shri Mohammad Ali Jinnah. Two of the greatest South Asian powers, India and Pakistan have been led by the sons of Gujarat, which is a rare feat for any place in the world. Also, one of the wealthiest entrepreneurs of the century, (as declared by ToI poll in 2000) Mr. Dhirubhai Ambani was born in Gujarat – who, from a meager Rs. 15,000 created billions of rupees and numerous job opportunities for thousands of people in India. The Ambani family is now the second richest family of world (based on the combined wealth of Mr. Mukesh Ambani and Mr. Anil Ambani). Historians also claim that Gujarat was the trade centre of India and the centre of cultural exchange with the foreign world in ancient as well as medieval times. Father of the Nation, Iron man of India, Quaid-e-azam, Vikramsarabhai, Homi Bhabha, Dhirubhai Ambani, Ratan Tata, Mukesh Ambani, Anil Ambani, Azimpremji, Sam Maneckshaw……. the list goes on and on. Gujarat has been the place which evoked in me fascinating thoughts. It had sown in me the sapling of adventure, enterprise and innovation, ingenious until the morning of 28th Feb, 2002 when everything changed for me. With the subsiding years of my childhood and the settling in of teenage, the load of studies increased exponentially. Cartoons and wrestling gave way to movies and computer games, GFs and hangouts started to enter in my life, bad or good memories of Gujarat rarely mattered. There were lots of things to catch up in this ever expanding world and I had the same negative feelings for years and years about Gujarat until…..
By the end of the month of May, the result of JEE and AIEEE exams were out. I fared poorly in JEE and in AIEEE my rank was around 64,000 (Sixty Four Thousand)—eliminating my chances to get into any of the prestigious NITs. By mid-June, the result of all the other examinations including DCE and COMEDK were also declared. My performance in all exams were modest and in this scenario of cut throat competition, I failed to excel (despite dropping a year for better preparation) causing much reason to worry and panic. Going by the results, I had only two options left—one was COMEDK located in Bangalore and the other was entrance to PDPU situated in Gujarat through AIEEE Rank. Thus, I had to make my mind between COMEDK and PDPU only. Everything was going unexpected (and undesirable) in my life till now. By providence I got to know about Pandit Deendayal Petroleum University and not even in my wildest dreams had I imagined that it would be located in the place I have loathed till now. It was going to be my ‘Karma Bhoomi’, my workplace. To my utter surprise my father who till now was strictly against me going to Gujarat, decided against the wishes of my elder brother and many relatives of mine to get me admitted in PDPU, leaving aside his notion of discrimination in Modi’s Gujarat—just a week before my departure for Bangalore on waiting tickets. His decision took me by a surprise, given his previous attitude of not sending me to Gujarat. Later on I concluded that he took this important decision of his son’s life after getting continuous assurance from his colleagues who have been posted in Gujarat in past as well as customers of Bank with whom he had long discussions. He had started believing that there is nothing wrong in living and studying in the stat which is the most developed state among the other Indian states and he was made to believe by numerous people he had discussion with, that it is just a myth that Muslims are ostracized in Gujara—a notion which my mothers and brothers strictly didn’t adhere to, having been never a part of those discussions. With the haunting dreams of riots and killings, I was welcomed in the city founded by Sultan Ahmed Shah in 1411 AD—the thriving city of Gujarat— Ahmadabad. On 24th June 2008, we landed on the land of Mahatma, on the place that formed an integral part of heated discussion and debates even 1600 km away, on the place that has kept everyone in my home agile and in discussions from the past two months. I was a bit pensive about what the future has in store for me in Gujarat, after the dream which made me upset and dampened my mood of taking admission here. We moved out from railway station for checking into a hotel. I was struggling with my luggage when my father shifted my attention to a big hoarding right in front of the Railway station, with the picture of the Honorable Chief Minister Mr.Narendra Modi in a deific pose and said to me sarcastically: “Chotu, Welcome to Modi’s Gujarat”. From the hoarding it appeared that Mr. Modi himself has invited me and my father to his Gujarat which seemed ironical to me at that moment after that rude dream. “Gujarat is all about Trade with Tradition, Commerce with Culture, Enterprise with Entertainment and Development with Disaster management. Welcome to Vibrant Gujarat” was written beside the poster featuring the Showman of Gujarat. To my surprise, just beneath the poster a bearded man with symbolic skull cap in White Kurta Payjama was running his roadside tea shop at ease. The man selling tea was oblivious of the fact that the sight of him conducting his business under that particular hoarding created waves inside a young 18 year old boy which shook away his initial apprehensions of a biased Gujarat. Kalupur was the area where we were stationed. (The place Kalupur is predominantly a Muslim area and is very busy and crowded due to its proximity to Railway station). Even in a glance I could easily see lots of Muslims crowded in Kalupur with their traditional beard, skull caps and Kurta Payjama either as pedestrians, or as petty businessmen conducting business on the footpaths with their Hindu counterparts. There were other numerous enterprises like hotels and shops operating in the vicinity of the station which were run by members of the Muslim community in a harmonious integrity with Hindus community. The city, in it first impression was very fast and the standard of life was similar to that of New Delhi and way better than Patna. There was no uneasiness in the environment. Everything seemed to be in order and there was no chaos anywhere, all due to proper administration which could be felt and observed. The people were very cooperative and were always ready to help us. Peace and stability was felt in the environment. Soon both of us started to settle in ‘Ahmadabad’, the place with lots of speculations on rife. Also, as the time passed in Ahmadabad, the nervousness that has been set in before coming to vilified Gujarat started to fizzle out from my mind after seeing so many people happily enjoying their life in such a vibrant atmosphere. There was no taint of prejudice, racism, intolerance, bias, narrow-mindedness or chauvinism here. There was no proverbial hue and cry regarding anything. There was order, neatness, tidiness, stability, calmness, harmony, lawfulness and serenity in the atmosphere. Everything seemed to be in order and I could sense that the citizens were quite relaxed and happy. The place was similar to any other part of India. The people here were same as rest of Indians struggling with their life. There were all types of people present here, from extremely poor to rich, from black to white, from orthodox Hindus to conformist Muslims, which affirmed India’s diverse tradition and culture in this geographical entity. Also Gujarat’s commercially sound culture has made it the most ‘Fast-Forward’ state in India. Comparing the actual scenario in Gujarat with the stereotypical stories I was fed on came as a big shock!! I was warned by everyone about being unsafe in Gujarat but I felt safer here, as the personnel of Gujarat police dotted every crossroads and major markets and places of Ahmadabad. I was told that I won’t be able to feel free in Gujarat but people here were freer in their mindsets due to the peace and calmness of the environment. I was even told that for a member of the minority group living in Gujarat, it’s a life of impending fear of being killed anytime. In the contrary I saw an almost equal number of mosques anddargahs lining the various lanes in Ahmadabad just like the temples and ashrams. Also, Muslims were free to practice their religion and roam freely throughout the length and breadth of state. It was hardly any different from my birthplace Patna except the cultural difference and the language. Everything in Ahmadabad seemed to define vibrancy, and for me Indianness means “Tolerance, Sacrifice and India over everything” which seemed to be imbedded in Amdavadi’s spirit. With the passage of time, I got acquainted with the Gujarati culture and started enjoying my stay here. Whatever I had heard about Gujarat in the past was all being proved false one by one. There was independence, freshness and pleasantness here. Local Gujaratis were very helpful and ready to help us whenever we faced any problem. Facilities provided at certain places were exceptional. There is no problem of loot and theft, women are respected here and are given equitable position in society. Gujarat for me looked like a big family, where everyone bonded well and cared for each other here. Each and everything happening here was reported back to my parents in Bihar which relieved them from their anxiety and made them delighted because of my success. All these observation were also affirmed by my friends of college who also came from other states. Slowly the innumerable calls from my family and aficionado relatives to know about my well being and safety started to decrease as everything went smoothly. Everyone, after ending the call used to always remind me to ‘Take Care’ to which I use to adamantly reply back that there is nothing dodgy here and everything is fine. The daily newspapers around mid march in the year 2010 were full with Special investigation team inquiry reports revolving around the person who is hailed by the masses of Gujarat as the gaurav(pride) of Gujarat. In those times if one browsed through national, editorial or any other page of any newspaper available, there used to be some news about Mr. Modi, barring on the sports page (Gujarat Cricket Association was inactive at that time, else the journos would have marked him present there too). Everyone, from print media to news channel to the concerned people whom I have met in college talked about Triple M (Modi, Muslim, Media) only. The Samrat of Gujarat was present everywhere (in discussions over hot chai, MBA discussion rooms, college canteen, hostel rooms). The discussions varied from judging his actions and involvement in riots, to various other related things. The discussion often proved to be futile with one side fiercely claiming that he is right (My Gujarati college-mates use to be very adamant on this) and the other side blaming everything on him. The judgment used to be very divisive with nobody knowing the real thing as to what had actually happened. And, the matter of fact was that nobody knew the real motive of discussion at all. From editorial articles in newspaper to guest columns in the magazines (by so the called secular personalities) to road side dhabas to air-conditioned discussion room, everyone was busy passing a judgment about the bearded man from Gujarat who rose from nowhere to become the showman of one of the most highly developed state of India. After being subjected to stereotypical since childhood, finally I was forming my own viewpoint about the man who is shown as anti-secular, inhuman, alleged perpetrator of the worst riots of 21st century along with a host of other allegations which the human rights group and other NGOs have imposed on him. Every day, I used to think whether Mr. Modi is right or wrong, or why is he so much in news all the time? What is there in him that attracts so much of media glare? Why this man is so much in demand? From microscopic to the biggest, everything in Gujarat was eventually linked to this man!! I have heard a lot about this man in my growing-up years and have had reservations about him and his party, BJP. But after overcoming my reservations about the man during my stay for two years in his Gujarat, I started introspecting as whether he is really wrong or framed so—what’s the real matter with him? I also contemplated that since almost all my notions with which I came in Gujarat were churning out to be wrong after my experience of stay here, was this long held belief of Mr. Modi being the ‘mass murderer’ also untrue? I have been an awakened youth due to circumstances at home and surroundings post 9/11 attacks, and this facet of my personality again led me towards search of truth as to who is right—Media or Modi? Also, the consistent provoking of this democratically elected chief minister of Gujarat in full media glare and those innumerable varied views about Mr. Modi from different sections of society made me curious to know the reality of this man. In this world of Internet, RTI, blogs, the reality check is fairly easy, so I finally pushed myself to know the real truth about the man who has been in my thoughts and has been on my mind since almost a decade. Now a mind of this 20 year old could gauge the reality easily. Is he a hero or is he a killer? Is he good or bad? Is he right or wrong? I was deeply confused regarding whom to believe. On one side was my long kept belief of Mr. Modi being a wrong person—a belief instilled by various articles of national dailies, NGOs and Human right groups reports, and on other side was my experience of staying almost two years in the state administered by him from the last eight years where holisitc development, corruption free environment, safe atmosphere and most importantly visible sense and sensibility in administration was felt by me personally. The reading and analyzing the related discussions with my close Gujarati friends and members of faculty confused me even more, for those varied opinions couldn’t whet my appetite for the answer I was looking for. The day was 20th March, 10. I had just finished watching the movie PARZAANIA at 3:00 AM. The movie brought back the nostalgic feeling with which I came to Gujarat as it portrayed the controversial topic of Gujarat riots and those feelings of discrimination and apparent prejudice possessing which I first stepped on the land of Mahatma on 21st June, 2008. The warnings of my nonagenarian granny and relatives all started to haunt me back. I became disturbed and tensed. The whirling sound of the fan echoed in the room and I remained unmoved staring at the screen of my laptop as to demystify the truth within myself and thinking once again about what is wrong and what is right? After the laptop went to the sleep mode and the beautiful picture of Katrina Kaif on its wallpaper vanished, I noticed that it has been almost 20 minutes since movie has finished. I do not know whether it was a divine intervention on my mind in that odd hour, or any other miracle as we Indians firmly believe in, or just incredible out-of-the- box thinking, but the question struck me— why not ask the the man himself whether he is right or wrong? Why to believe what others say when I can try out myself to talk to the person and satisfy my personal appetite for the actual understanding of the most talked about person of Gujarat. Till now I have tried everything like internet and personal discussion with people of almost all affiliations but none of it made me drawn to a strong conclusion. So, I thought to give a chance to this final option. I was looking for the shortest and the best way to make my voice heard and tried the most unconventional way of reaching out to him (Today’s youngsters have this habit of following unconventional ways rather than the conventional path as it satisfies the rebel inside). That was the blue chirping little bird that has revolutionized the world –TWITTER. I thought to give the micro blogging site Twitter a chance as it appeared more interesting than going the conventional way of contacting (I thought this would increase my chances of meeting him and discuss things) and if this way fails then I can definitely look out for various other options that I had. Almost one hour had gone in this thought process when I returned to my desk and logged into my laptop. A new rush of energy flowed in my veins and without delay I logged into my twitter account. Around 3:58 AM, I sent four broken messages (as direct message on twitter cannot be more than 140 words) to Shri Narendra Modi on his Twitter account. The messages that I wrote to a head of a state for request of an appointment was written in the most eccentric manner that anyone could have ever written till date! The letter was written in SMS lingo without any greetings and without any hint of sycophancy. It was spontaneous, I just wrote what came in my mind and without any apprehension just wrote the last line—I want to meet you Honorable CM! Before sending the message I once again thought and pondered over whether I am doing the right thing, and if it will bear any repercussion, but my mind and heart voiced in unison to go ahead, for there is no harm in meeting a democratically elected head of government. I thus clicked the send button at last. I clearly remember the date and time when the most important call of my life till date came. I was sleeping on 26th March when the phone rang around 9:07 AM. In the midst of morning dizziness, I saw my mobile screen and was shocked to see a call from a landline number from Gandhinagar . I instantly woke up and picked the call. 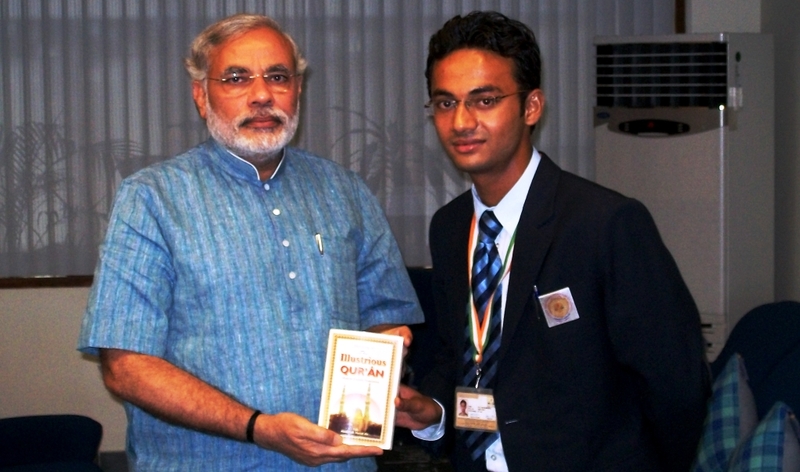 From the other side, the voice appeared— “I am Mr. ******* From CM Office…………” My heart skipped a beat, my mind drizzled and when the call ended after one or two minutes, I just knew one thing— my appointment with Mr. NARENDRA MODI, THE HONORABLE CHIEF MINISTER OF GUJARAT was fixed. Nothing more I remember except saying yes or no to the person who called me. I sat down and pinched myself to know whether I was dreaming dream or this was the reality indeed. The moment, that pinch evoked a sent an exciting shrill across my body, and I knew that I was in for a special week ahead. The date was 1st April, 2010 when the meeting was eventually fixed through various phone call exchanges between CMO and me. From my coming to Gujarat nursing prejudices, to the meeting with the CEO of Gujarat! Life is unpredictable indeed! Destiny (or Karma or Qadr) came alive to me. The road connecting Central Patna to old Patna (from Gandhi Maidan to Patna city named as Ashok Rajpath) was blocked and barricaded. Eager pedestrians and local commuters were buzzing on either side of roads peeping out from the swarming crowd to have a look at the deserted road and to get a knowhow of the situation. Whistles of policemen armed with lathis filled the air amidst noise and commotion of stranded crowd. In the midst of all the chaos, a police jeep with siren zoomed past the desolated road. A cavalcade of vehicle followed and somebody in the crowd shouted that the car had a popular politician inside. As soon as that announcement was made, there was a huge uproar in the crowd and it went berserk trying to get out from the barricade and have a glimpse of the man who has came to Patna for a public address. The public who stood behind wanted to come forward and who were in front wanted to break the barricades, just to meet and have a glimpse of the extremely famous politician of India. I was 10 year old boy at that time and was holding my impatient and tired father’s finger among the group of people. My father was accidently struck up in the barricade while returning from his workplace in the evening. Seeing the frenzied crowd, their shouting, their cheering, their applause, after the popular leader came I was star-struck and almost went into a trance. After that politician left, I asked my father, “Papa what is the qualification needed to become a politician? Can I also become a politician and be as famous and loved?” My father who was busy in veering through the heavy traffic jam after barricades were open shouted back in a fit of rage, “Are you mad? Politicians are very bad people. They are criminals, foul mouthed and do not have any respect in society. They are not humans but animals who for the sake of power can kill fellow human being and betray anyone because they possess no inner consciousness. The present condition of India is just because of our corrupt politicians. The only qualification you need to become a politician in India is that you must have murdered someone or be a goon of the area you are living in.” Fearing more repercussion from my father, I didn’t continue on the topic and became silent. And after a moment, my discussion fizzled out in the same way as the traffic jam there, and my dreams of becoming a famous politician like former prime minister of India came to an abrupt end due to the harsh reprimanding from my idol, the mentor of life—my father. Sincerely speaking, as I grew up the image of a politician formed in my mind after the rebuff from my father (and consequently from reading and analyzing the news about scams and irregularities by politicians, their projections in movies and other visual media) was that of them being laidback, corrupt, dishonest, assertive, disrespecting, liar, hypocrite, fraudulent, surrounded by goons or flatterer and unscrupulous. Even Google, on searching the meaning of the word politician gives following definition “A seeker or holder of public office, who is more concerned about winning favor or retaining power than about maintaining principles.” According to official Facebook and Twitter accounts of Mr. Narendra Modi (whom I was going to meet soon) state his profession as a politician and I too had apprehension of him being one of the packs but it was almost contrary to as it was expected to be. It is quite a tough task to reach the powerhouse of Gujarat, the Chief Minister Office (which is the focal point of Government of Gujarat and where Mr. Modi himself sits, formulating innovative, constructive and result oriented progressive policies for the promotion of proper governance in the state. It also acts as a catalyst to play a significant role in the affairs of the State.). after reaching the fifth floor of 1st Block of Gandhinagar Secretariat, passing various security checks, you tend to forget that you have reached a government office. I personally felt as if I have come to an MNC headquarters situated in Bangalore or Gurgaon looking at the serenity and maintenance of the corridors and waiting rooms. In first glance the office looked quite beautiful, clean, and peaceful and well built as opposed to the normal government offices, which appear shabby, dated, overused, mishandled and crowded. An ISO 9001:2000 certified office and its staff, in the very first look came across as cultured and professional, and made me awestruck by it appeal. The most prestigious address of Gujarat is this place, which houses the powerful Chief Minister of state, Mr. Narendra Modi. The place thus is expected to be extravagant, magnificent amount of wealth on display. The common people (me included) usually assume that the place where such high and mighty people work is a congregation of influential and dominant people, with a host of state-developing agendas brewing inside its premises. With the similar assumptions of the SUVs and Khadi, I entered the Honorable CM’s Office at 4:30 PM. But the scenario inside offered a stark contrast. It was a simple, no-nonsense office. Instead of the anticipated hum-drum and cacophonous bustling, there was serenityin the environment, which was the last thing I had expected to prevail in CMO. Apart from Mr. Modi’s assistants and cleaning staff, no additional staff was present on the floor and thus the long held view of a politician as shown in movies surrounded by his flatterers and goons also went kaput. The people present in CMO (on whose direction the state administration was going on smoothly) were expected to be arrogant, high-headed, and disrespectful but people there were chilled, friendly, responsive and cooperative, who talked animatedly and wished me luck before the meeting! I had reached Gandhinagar Secretariat at exact 4:30 PM on 1st April, 2010 for the scheduled meeting. Before reaching Mr. Modi’s office on the fifth floor of first block of secretariat we have to take lift from ground floor and the ground floor was full of awards that the Gujarat Government has won over the years. This was again a break away from the normal functioning of the government offices—efforts to create a brand value of its own to increase the respect for the office before public. Now as soon as I sat down in the waiting room of CMO on the comfortable sofa, I was given a tea and a copy of Sachar committee report, a gesture too courteous by the standards of usual government offices where even being offered a glass of water is a luxury in itself (I have a certain Idea about work culture of government institutions as my mother herself is bureaucrat). It was around 5 in the evening when I was called for the meeting. As soon as I entered the room with a pale nervous face, and a visibly shaky walk, Mr. Modi (who is an excellent observer of human psyche) himself stood up and said, “Sultanji, Aaiye Baithiye (Sultan ji, please come and have a seat)” to soothe my nerves and make me comfortable. He even ordered for a glass of water to pacify me and initiated the conversation to break the ice. After the initial hiccups, things started to roll nicely in the meeting and I shared all my doubts and apprehension I had for the man himself, with him. Right in the beginning I told Mr. Modi that I am a simple student from Bihar, and I had come there to clear all my doubts regarding him, to which he nodded warmly, signaling me to go ahead. My first question to him was regarding the apprehensions people back home had about my safety in this state. What was the reason behind the perception of minorities being unsafe in Gujarat? To this, Mr. Modi counter-questioned me—have ever you felt unsafe here at any point of time? Did you feel anything wrong was done to you? I quickly replied in negative and told him how much at ease I was in Gujarat. He went ahead and explained that this whole perception of minorities being unsafe in Gujarat is actually fabricated by certain groups with vested selfish interests, and some factions of the media. Such is the influence of Media that people coming from outside, without living here for a single moment brand this place as evil and unsafe. She further said that I invite such people to come to stay here and feel the warmth of ‘Vibrant Gujarat’. After my first question was answered, my next question to Mr. Modi was regarding the most serious allegation on him, that he is anti- Muslim and has done nothing for the Muslims during his stint as CM of the state. I don’t know to how many people have asked him the same question, but he smiled when he got this question from a 19-year-old guy. Mr. Modi started by citing the examples of Muslims growth in his state according to Sachar committee report. Examples of Mr. S. S. Khandwawala (the first Muslim DGP of the state); of his friendship with Mr. Gulbaig of Kutch, whom he visits once in a year; of distributing aid from CM Welfare fund to the people without any religious bias; of ensuring equitable distribution of water from Narmada to everyone in the state rather than distributing it to preferentially; of Muslim representation in government jobs; of Per capita income of Muslims (one of the highest in India). He explicitly said that he never thinks of Muslims and Hindus as separate entities, and thinks only of 5.5 crore Gujaratis as a whole and their development. It indeed took me by surprise. I, being a Bihari and Muslim was enjoying the fruit of his vision (PDPU has been established by his efforts to have sufficient manpower in energy domain of Country) but was unaware of this fact, and would have remained so had he not told it himself. He continued that during a meeting with Sachar committee members where he said the same thing that he had not, and would never will do anything specifically for Hindus or Muslims. The efforts would always be for the betterment of 55 million Gujaratis, who have chosen him to be their Chief Minister. He concluded the answer by citing another example of the Kite Industry. Kite making industry is traditionally run by the Muslims, and was experiencing steep decline until it was revived by organizing the Kite festival every year in January. This helped the people involved in the business to bounce back from bankruptcy, and live an economically sound and happy life. In between there was some more discussion on how some vested interest groups and sections in the media report malicious facts to vilify the state for no reason. After this question I finally let out the Djinn of Godhra which has been disturbing me from past eight years and Mr. Modi as well, on whose mind Godhra has been looming for a long time. Mr. Modi paused for a little while and then started explaining to me in detail the events which happened on that day and thereafter. Such was his minute detailed explanation that I felt being transported to Godhra and Gujarat of those times. He gave a detailed description about government action on rioters, curfews which were imposed in Gujarat as soon as riots were started, the police action on rioters and many more things. He even compared the Godhra riots with the Anti-Sikh riots of 1984 and talked about the difference between the actions taken by the government in both the cases as soon as the killing started. Along with it, Mr. Modi even emphasized on the fact that in Gujarat, peace was restored in most of the places within 72 hours of riots while in 1984 riots, nothing was done in the first three days, which caused dangerous losses to the minority community involved. Then Mr. Modi described the actions took by him, like dispatching immediate orders to reserve police for taking strict actions against the erring people, strongly dealing with casualties and finally providing for rehabilitation. Afterwards, I questioned him about the political vendetta against this hardworking and no-nonsense politician, and the reason behind his negative image endorsed by the media and Muslims. Why people are not ready to accept his accomplishment despite being aware of the fact that it was he who had ushered in development and brought numerous big industries into Gujarat. To this he laughed and recalled to me one of the sayings by The Prophet of not being afraid to speak your heart if you have not done any wrong. . Hence, he explained, he has never shied away from saying correct thing anytime, even in full media glare. He sat in front of the SIT for 11 hours because he knew he was right and is ready to go through the similar experience even if he is summoned again. He added that if proven guilty then he should be given such harsh punishment that no other Narendra Modi should raise his head in this pious land of India. He said, “My main motto is to serve the people as they have reposed their faith in me and my main job is to provide them with things which I had promised when I came to power. As far as my image among the Muslim community is concerned, it is all because of vested interest of certain NGOs comprising of the politically motivated elements, and certain sections of the media, which try to instill such hatred and biased notions. He said, I am an open about my ideas and people are always welcome to come and talk to me if they have any problem with me. But even before meeting me, despising me or branding me as bad won’t do any good to them. I am under the constant public scrutiny, and people are always welcome to criticize me and judge me. Hence, I look forward to such healthy criticism. He said that in a democracy, criticism is but indispensible, but nowadays there is no criticism—only allegations— which is unfortunate indeed. By the end of it, the meeting, which was scheduled for just 5 minutes on record continued for 45 minutes, and to my surprise it had to end abruptly as the numerous visitors in CMO had waited enough! It finally ended with a photo session with the Honorable CM who held the Holy Quran in his hands. I felt serene. It was a satisfying and enriching experience for a restless, curious young boy searching answers for his questions, all of which had been answered properly just a while before. Only after I came out, the realization of the humility possessed by Mr. Modi occurred to me. Imagine the Chief Minister of one of the richest states of India himself inviting an engineering student with open arms to quell his curiosities. Never even once during the course of our meeting, the longest serving Chief Minister of Gujarat boasted of his powers, authority and hold over the state, which made me sit back and finally admire the person who has swayed six crore Gujaratis with his style and persona. Mr. Modi is disciplined, well dressed, respectful and non-assertive, and thus meeting him in person washed away my stereotypes of all politicians being corrupt and fraudulent. It is also said that Politicians and Actors in India are never punctual, but everything was bang on time which dismissed another notion of the laidback attitude of the politicians. I had my initial reservations about meeting such a busy man of this stature, but all those fears vanished in the thin air when he warmly told me to “fearlessly ask everything you wanted to ask from me.” I bombarded him with plenty of questions, but all of them were patiently answered and I left only when I was convinced by all the answers he gave. Mr. Modi could have sent me to any of his subordinate but he himself chose to listen to all my questions and replied accordingly. Throughout the course of the meeting, not even once did I feel that I was sitting in front of a person who has been dubbed as Villain or Killer by so-called advocates of secularism, in whose governed state I was constantly told not to go to. What more can I say about this man who was conducting his office like a professional CEO. I was awestruck by his style, charm, suave appeal and above all, humility. This visit to CMO taught me the important lesson of simple living. It exudes the strength which can revive the Indian principle of ‘simple living and high thinking’. Today, even a young engineer with a MNC drawing fifty thousand bucks per month never lose an opportunity to flaunt his extravagant gadgets and hefty credit card bills, but here the CM of a state was working in such a simple office!! Why Won’t the PMO Respond to RTI Requests About Who TWEETS for Narendra Modi?